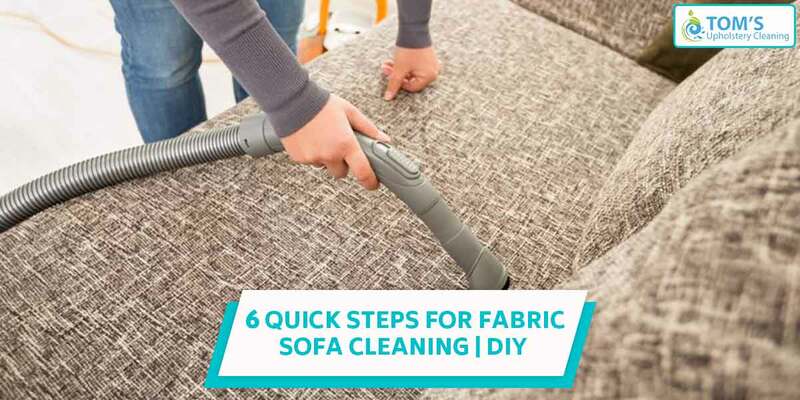 Fabric Sofa Cleaning depends on how often you is the usage and how you use it. It also depends of the kind of sofa upholstery. But since it is a sofa upholstery we are talking about, the dirt on it is easy to accumulate, this is because the usage of sofas is daily, generally speaking. It is advisable to remove the stains as soon as they occur. If you are pondering over how frequently you should get your sofa cleaned, we have gotten the answer for you: carry out a regular vacuum of your sofa every two weeks. If you have to have pets and kids or someone in your household suffers with allergies or asthma you should do the sofa fabric cleaning as often as you can. It is advised that along with dusting and regular spot-clean with vacuum you also get a steam cleaning done once in a couple of months. Steam cleaning kills bacteria. Before fabric sofa cleaning most sofas come with a tag – check this to determine the best way of cleaning for your couch. Keep in mind to not forget to spot test any cleaning solution you’re about to use in an inconspicuous spot. You can get a professional sofa cleaning team to get your cleaning necessities meet. Tom’s give out the best upholstery cleaning in melbourne and across suburbs. Our experts will give you utmost satisfaction along with same-day, on-site cleaning service. Our experts have also itemised a step by step list to give you a quick sofa cleaning. Thoroughly vacuum your sofa first, this will remove the main dirt and dust. You can vacuum the sofa regularly. Use a lint brush and brush your fabric sofa to remove any pet hair and lint. Lint brush is a must have sofa cleaning tool. Mix a mild laundry detergent with water or a specialty upholstery product for an all-over clean and to sanitise/deodorise your fabric sofa. Make sure to avoid oversaturating and scrubbing your sofa or risk damaging the fabric. A formulated stain guard spray to protect your fabric sofa is all you need now. They repel liquids and prevent stains from sticking to the fabric.